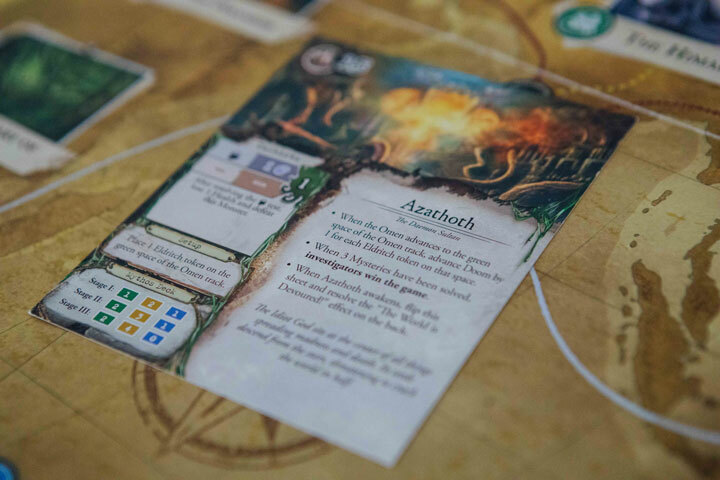 Look, we appreciate fully that Eldritch Horror may not be everyone’s cup of tea. It’s long, unfair, and deeply random. If it took as much pleasure and effort in describing your success as it does in your failures, it might even be more satisfying when you win. Seriously: the game has painstakingly-written entries for every pan-dimensional opponent in the game. It takes enormous pleasure in describing what happens when you fail to stop them. Sometimes you can even screw it up twice, just so the game can laugh at you a bit more. The back of this card – which you read if you fail – talks about insects consuming the sun and things being on fire. It doesn’t mention winning. At all. And when you win? When you win the game just ends. It’s about one level of satisfaction up from ‘and then we woke up and it was all a dream’. But here’s the rub. 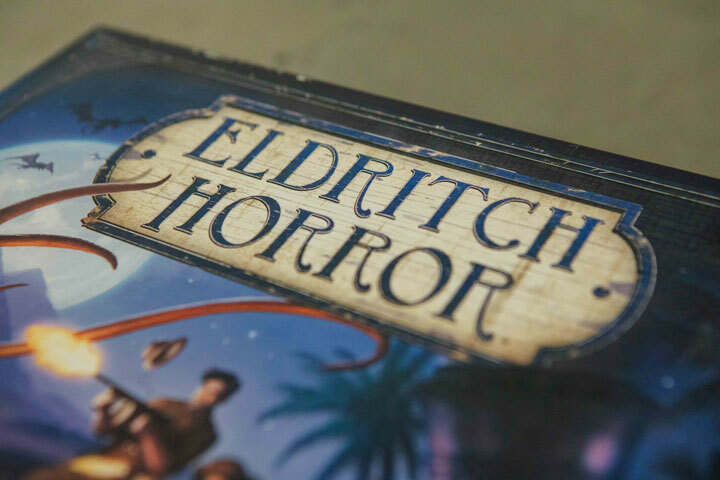 Eldritch Horror isn’t about winning. Not really. It’s about enjoying the ride – about laughing as your gangster’s debt comes due or another hilariously poor roll sees you locked up in a Turkish prison, talking to the cockroaches while some nameless evil rises from the ocean’s depths. We’re terrible at it, by the way. We’ve eked out maybe a handful of wins over many plays – but the laughter has kept us coming back over the years. We like Eldritch Horror. We’ve found a lot of mileage (and collective mirth) in laughing at the stories it generates, pinballing from unlikely successes to its frankly embarrassing lows. You will shout with glee when your shotgun-toting jazz trumpeter finally rolls enough successes from a fistful of dice to blow a shoggoth into smithereens. But you’ll REALLY laugh when your companion discovers the cost of that pact they made with dark powers. 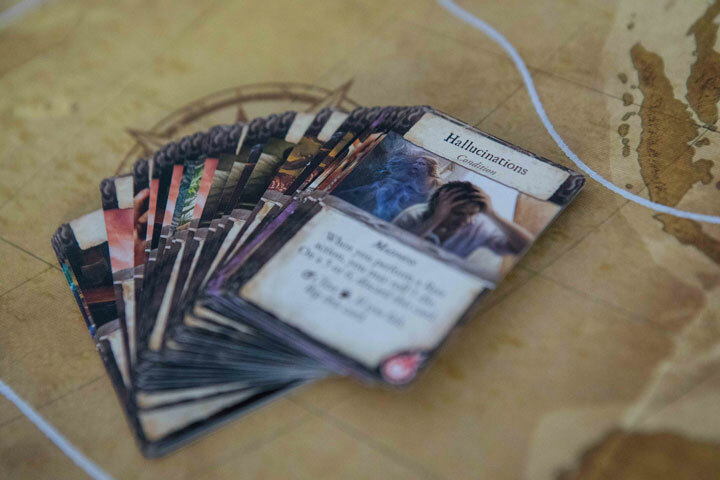 And that’s all down to the reckoning – the jewel in Eldritch Horror’s crown. When that little symbol pops up, everyone pays attention. They’re all hoping it’s your turn to suffer this time. Your turn, so hopefully… not theirs? Because sometimes, you can escape the reckoning, if the dice smile upon you. Nail the right roll and it’s not your time. Your debt hasn’t come due yet. Maybe that back injury you picked up diving out of a window in Istanbul hasn’t prevented another daring escape. Maybe you’re holding the paranoia at bay just long enough to make it through an otherworldly portal and back out with forbidden knowledge. Or maybe not. Maybe it IS time to pay the debt. Perhaps it’s time to see what’s really making that scratching noise behind the walls. The one that only you can hear. Maybe that dark pact means it’s time for someone to die, and you’re smiling because it’s not your pact, so it’s not going to be you. Or is it? Oh yes. When the reckoning comes round, Eldritch Horror comes to life. It’s a simple concept. There’s a cost to many failures in the game. You might injure your leg as you escape a confrontation, or the sights of cyclopean alien landscapes might leave scars on your psyche. The true cost of those failures isn’t always immediately apparent. 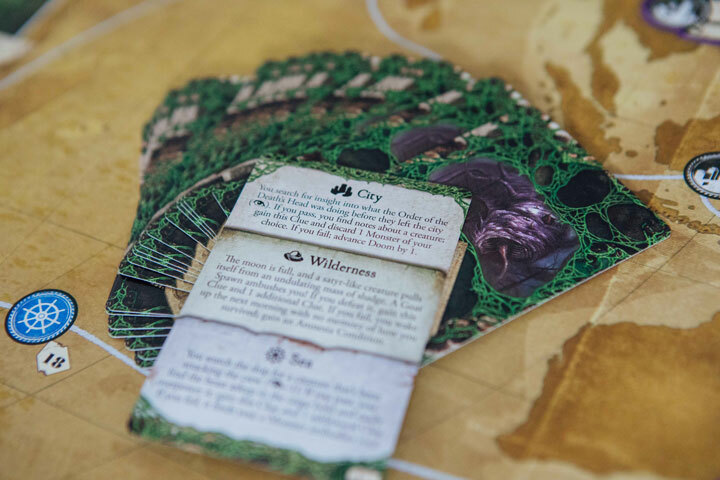 Each condition is written on its own card, with some flavour text and instructions of what to do when the reckoning rolls around on the front. When the event deck (cards you draw from each turn that really push the game forwards) tells you it’s time, you follow the instructions, and sometimes (read: often) turn the card to learn your fate. Here’s the rub. There are multiples of each condition in the deck, each with a different repercussion. Until you flip yours over, you don’t know which one you’ve got. And that, friends, is what makes Eldritch Horror a work of non-euclidean beauty. It’s not perfect: the reckoning is baked into so many aspects of the game that when it crops up, you’re going to be doing a LOT of admin. That admin is what keeps the cogs of the game turning. It’s also what makes the game run over several hours. But it’s worth a play, if only to marvel at the beautiful intricacy of those cogs. The mechanisms of the game really do turn over and into one another as it happily chugs along. 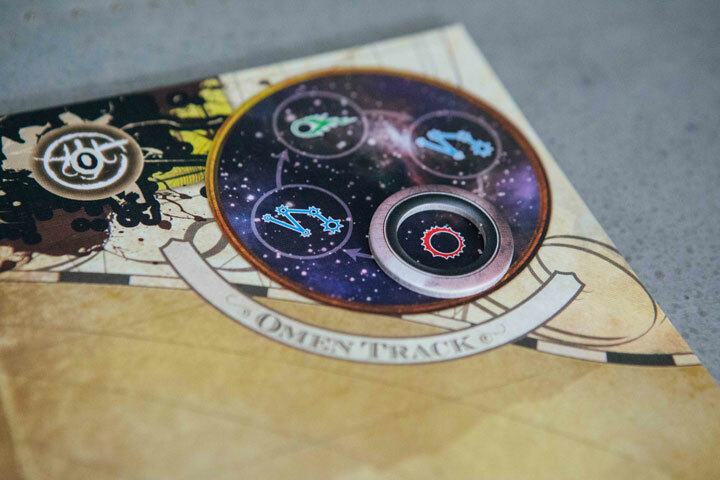 And it’s definitely worth a look to marvel at the reckoning… can you stay ahead of your fate long enough to win?